This document is another piece of the puzzle in my search for the parents of Martin L Lambert. Martin L Lambert was born in 1873. He is enumerated in the household of William "Buck" Lambert and his wife Talitha Herrin Lambert in 1880 as their youngest son. He died in 1892 and in buried in Lambert Cemetery No. 1 in the old Lambert community, Almond township in Stanly County, North Carolina, not very far from the Cabarrus County line. The mystery lies in his marriage license. 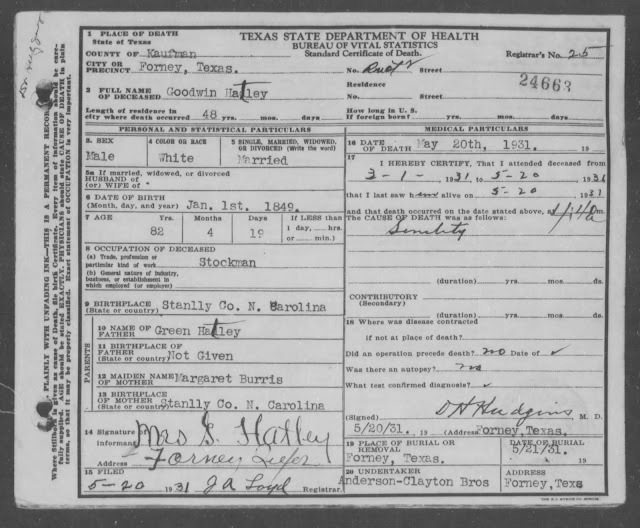 He married on January 9, 1891 at the age of 18, to 16 year old Rose Etta Starnes, daughter of A. M. D. "Mack" Starnes, who lived near him and in the home enumerated just before him in the 1880 census. They must have grown up as playmates. On this document, there is no father listed for Martin, and his mother named as Julia Ann Eudy. There were only two Julia Ann Eudy's who lived near the Lamberts who were old enough to be Martin's mother. Other Julia's were not old enough, or born later than he was. I told the story of the one whom I thought most likely to be his mother in my post, "The Interesting Life of Julia Ann Eudy Kirksey". But there was another Julia Ann in the Almond community, daughter of John A and Rachel Furr Eudy. This one lived in the Almond Community, not a fair distance from the Lamberts. This Julia married another Almond Township citizen, Gooden (or Goodwin) Hatley on September 5, 1874. This was a year and a half after the birth of Martin L. Lambert. In the 1880 census, Gooden and Julia were still living in the Almond community. All 3 of their children would be born in Stanly County, however, by 1900, they would be living in Texas, just like the other Julia Ann Eudy. The Hatley family, however, would chose the town of Forney, in Kaufmann County, Texas in which to settle. Forney is a proud little town in the northeastern quadrant of Texas, just 50 miles outside of Dallas. Forney was founded on the black clay prairies near the East Fork of the Trinity River. The earliest settlers did not begin arriving until around the late 1840's. The railroads did not arrive until about 30 years later. It was originally a primarily hay growing area, with cotton becoming the crop later. Open prairie cattle ranches also sprang up in and near Forney. Jerry M. Flook's "History or Forney" describes the area in the 1870's and 1880's as a typical western town of hard-drinking, hard-gambling, hard-working men. Forney in the 1870s and early 1880s was known far and wide as a hard drinking, hard gambling, and hard brawling frontier settlement, despite the best efforts of the town fathers to build a progressive, respectable, and law-abiding town. Several tales of those rough-and-tumble days survive and are the stuff of Hollywood wild-west scenes. -quote from 'The History of Forney' J. M. Flooks. The Town was incorporated in 1884 and later disbanded. Around 1914, a major highway was built near the community and growth returned. It was near this highway, the Dixie Overland Highway, that the Hatley family were settled and raised. Goodwin and Julia lived a long life in Forney, Texas with their 3 children. Oldest son Van Buren Hatley married a Texas born girl, Lottie Elizabeth McFarland, served in World War I and raised a large family of 10 children: Verner Buren Hatley, Lewis Wetzel Hatley, Irene Julia, Fowler, Nora Lee, Lou Ellen "Peggy", Elizabeth A, Warren G, Ernest Young and Carrie Ann Hatley. Middle child Irene Rose Ann Hatley, married Ernest Young Moore from Georgia and had one son, Goodwin C Moore. Youngest daughter, Ada Ida Hatley married John Smith Robetson, who was born in Arkansas and raised their five children in Kaufman County, Texas: Henry, Kenneth, Edith Claire, Ione Gladys and Daniel C Robertson. 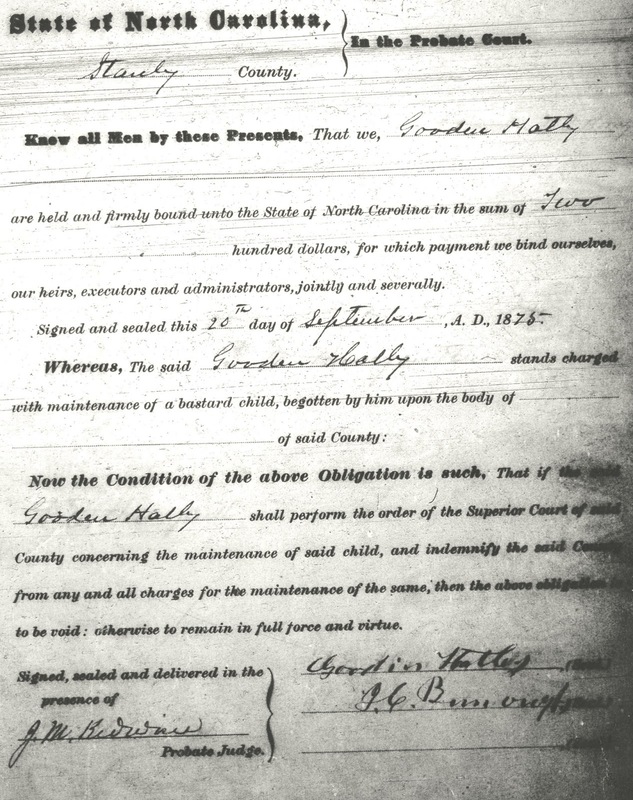 Who was Goodwin's firstborn child whom he was served a Bastardy bond on in Stanly County, North Carolina in 1875? Julia Ann Eudy Hatley only confessed on the censuses to being the mother of the 3 children she and 'Gooden' had in Stanly county. They had no more children, which was rare for the time. Was Gooden a man with wandering eyes, and feet? Was Martin L. Lambert the son of Goodwin and Julia? If so, why did they not raise him as they married the year after he was born? If Martin was the child the bond was served on, why was it served 2 years after he was born and a year after Goodwin and Julia married. Did Martin's daughter Lotha keep up with her grandmother Julia Ann after she too, moved to Texas? And which Julia was her grandmother, Julia Ann Eudy Kirksey or her cousin, Julia Ann Eudy Hatley? We may never know.